The field of pharmacy deals with preparing, administering and distributing pharmaceutical drugs and other supplements to patients. It also includes advising healthcare practitioners on the use of medications and performing medication therapy. Pharmacists are responsible for these functions and more, including the preparation of special doses, patient counseling, educating the public about various drugs, completing insurance paperwork, supervising personnel, managing stocks and supplies, filling out prescriptions and overseeing other aspects of a pharmacy’s operations. Pharmacists working at large hospitals are responsible for designing and evaluating drug programs for patients, while some may specialize in dispensing drugs, oncology, nuclear pharmacy or chemotherapy. The requirements to obtain a certificate of pharmacy include having a high school diploma or GED and possibly not having a conviction, felony charge or a revoked or suspended medical license. The basic certification offered is called the Pharmacy Technician Certification (CPhT), which includes courses in the areas of pharmacy security, inventory control, stocking management, handling of prescriptions, Drug Enforcement Agency regulations, controlled substance regulations and drug packaging and transportation. Students can also choose specialization courses, such as cancer therapy, geriatric pharmacy and medication development & testing which allow them to make rewarding careers in a field of their choice. According to the Bureau of Labor Statistics, employment opportunities for pharmacists are expected to increase by about 25% from 2010 to 2020. In addition to retail drugstores and large hospitals, jobs will also be created at private clinics and mail-order pharmacies. The BLS further states that the median annual wage for pharmacists in May 2014 was $120,950 with those in the top ten percent bracket earning more than $150,550 per year. How long does it take to get a certificate in Pharmacy? Pharmacy Technician certificate programs typically require the completion of 600 hours of instruction and 200 hours of an externship in a 10-month long program. What are the requirements to get a certificate in Pharmacy? To get admitted into a certificate in Pharmacy program, you will need to have at least a high school diploma or equivalent. 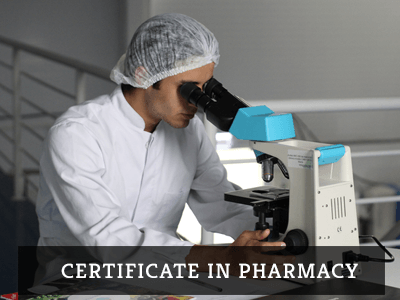 To complete a certificate in pharmacy, you will need to complete courses such as pharmacology, pharmacy math, fundamentals of chemistry and pharmacy laboratory skills. You may also be required to complete some clinical rotations or internship program relevant to pharmacy. How much can I make with a certificate in Pharmacy? According to the US Bureau of Labor Statistics, the median annual wage for Pharmacy Technicians was $31,750, in May 2017. Q:Are there any Online Certificate of Pharmacy programs? A:Yes. The online Certificate in Pharmacy is offered by numerous renowned schools like the Ashworth Career School. The distance learning programs offered by such universities helps students study the qualification of choice with ease. Online Certificate in Pharmacy provides better time management and is a favorite for individuals who are currently employed. The course structure is similar to the on campus one, major difference being that you can study the online course from anywhere, at anytime. Q:Which courses are taught in an Online Certificate in Pharmacy? A:Online certificates in Pharmacy can serve as a short cut to establish your career as a pharmacist. The certificate program emphasize on core courses like basic pharmaceutics, advanced biopharmaceutics, drug administration, patient counseling, applied health physics and public and law. These courses can prepare you to get enrolled in a bachelor's degree program in this discipline and an online pharmacy certificate from an accredited school like, Ashworth Career School can open entry level career opportunities for you in recognized hospitals, pharmacies and clinics. Q:Is there any degree or certificate in pharmacy related education? A:Yes. There are a number of degree programs as well as certificates and diplomas in pharmacy education. These include the certificate of pharmacy, Pharmacy Technician Certificate, Associate of Sciences in Pharmacy Technician and Doctor of Pharmacy (PharmD). PharmD. is the highest qualification in pharmacy education. These certificates and degree programs in Pharmacology can be obtained online as well as on campus-based institutes. Q:Which are the High Tech Institute pharmacy courses offered to students? A:High Tech Institutes offers two different degree programs in the field of pharmacy. It offers a diploma of pharmacy technician program, and an associate of applied science degree in pharmacy technician. The course curriculum of the above mentioned programs comprises of lecture classes and full fledged training sessions, where students gain practical experience in pharmacy. Q:What is the duration of the Certificate for Pharmacy? A:The Certificate for Pharmacy is a one year program if pursued in the traditional schooling system. It can be completed in more or less than a year's time span as well if it is opted online. The online Certificate for Pharmacy offers students the flexibility of completing the program in as much time as they see fit and take their classes whenever they want. Students can pursue the program from the ease of home and can also opt for part-time or full-time employment opportunities. Q:What are the contents of the course on Medication Safety in the distance learning certification programs for pharmacists? A:The Distance Learning Certification Programs For Pharmacists have dedicated course on Medication Safety. This course is of 3 credits in total. It is designed to offer students with comprehensive understanding of the potential adverse effects that medication may have on individuals. Students are also highlighted on how to curb the various medical errors and help patients as well. Q:What are the contents of the online pharmacy certificate courses on Project Management? A:The Online Pharmacy Certificate Courses on Project Management are usually 2 credits worth courses. These courses are designed to provide students with ample understanding of the applications of the skills, knowledge, techniques and tools that are commonly used in the project management practices. Students are also given substantial hands on experience. Q:Which courses do pharmacist certification programs usually cover? A:The usual curriculum of a certificate program in pharmacy includes courses in the fields of pharmacy security, stocking management, inventory control, drug packing and transportation, handling of prescriptions, drug enforcement agency regulations, and controlled substance regulations. The program aims to prepare candidates to deal with making, administering, and distributing drugs and other supplements to patients. Q:What are the general admission requirements for a post-graduate certificate in pharmacy? A:A post graduate certificate in pharmacy is non-degree program available at graduate level. This program focuses on pharmaceutical concepts and healthcare. To enroll in this program, students must have a master's degree in this field or a relevant healthcare field. Apart from this, students may be required to provide CGPA scores and letters of recommendation.